The primary concern that linked much of Darwin’s geological work in the Beagle years was to understand the changing relation between the levels of land and sea. In this he followed the example of the Scottish geologist Charles Lyell, whose three-volume Principles of Geology Darwin read during the voyage. Lyell argued that the history of movements in the earth’s crust should be (and could be) explained as the result of earthquakes, volcanoes, erosion, and other processes operating at the same intensity in the past as they did in the present. The earth had existed for long enough, Lyell claimed, that an accumulation of small changes could have enormous effects, even the raising of new continents from the ocean. As Darwin studied the shores of South America and discovered shells inland at thousands of feet above sea level, he became convinced that the continent had been uplifted in just such a gradual manner. His conviction was strengthened in February 1835, when he was witness to an earthquake that raised the harbour at Concepcion, Chile, several feet out of the Pacific Ocean. Some of Darwin’s most innovative work during the voyage related to the formation of coral reefs. For the previous two generations, geologists and navigators had sought to explain the origin of the curious ring-shaped reefs that we now call atolls. At the time of the Beagle’s departure from England, Lyell and many others believed that these reefs had been formed by the growth of corals around the rim of underwater volcano craters. Darwin argued that atolls were formed when islands in the tropical ocean gradually sank, in the reverse of the process that raised South America. Reefs around the shore of such a sinking island could grow upward to keep their surfaces near sea level as long as the island did not recede faster than corals could grow. Eventually the original island would be submerged entirely out of view, while the location of its former shoreline would be marked by a ring of living coral. Darwin’s inventive theory of atoll formation proved to be one of the most immediately successful products of the voyage; Lyell himself expressed great admiration for the new explanation and quickly abandoned his previous view. From the early days of the journey, Darwin had intended to write a book on the geology of theBeagle voyage. 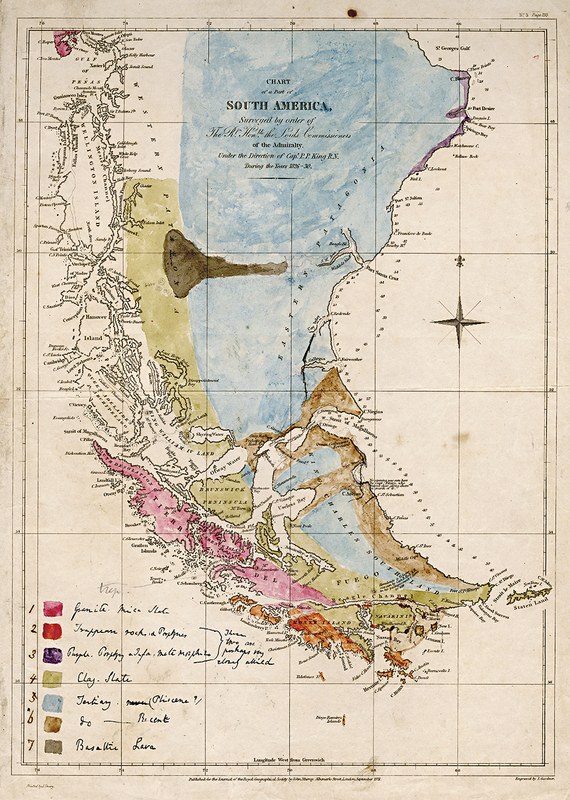 His efforts to write up five years’ worth of geologising eventually expanded and fractured into three volumes: The structure and distribution of coral reefs (1842), Geological observations on the volcanic islands visited during the voyage of HMS Beagle (1844), andGeological observations on South America (1846). Has just returned from crossing the Cordilleras. Geological observations of formations representing great epochs of violence which broke up the earth’s crust. Shells at over 12000 feet. Silicified trees in sandstone formations at great heights. Red snow and viviparous lizards. Botanical specimens.